GetUp! - #BREAKING: ALP to support corruption watchdog! #BREAKING: ALP to support corruption watchdog! After more than ten years of campaigning from GetUp members, the Labor Party has committed to supporting a Federal corruption watchdog. This is a huge step towards fixing our broken political system – and a big win for people-power. 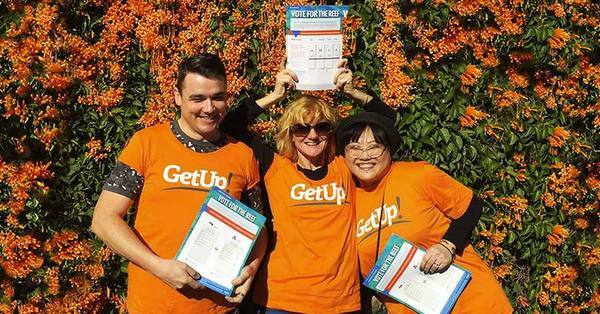 GetUp members have been in the fight to keep our politicians honest for years. And, working together, we're getting results! When politicians listen to the people they represent, it's always a good idea to acknowledge it. Politicians need to know that, just like we pay attention when they do something wrong, we'll also notice when they do the right thing. Can you take two minutes to email your local Labor MP or Senator and thank them for committing to cleaning up Federal politics? How does Labor's plan stack up? In order to work properly, it's not enough to just have a federal corruption watchdog. It needs to have the right powers, otherwise it risks becoming a rubber stamp for the same old dodgy conduct. Statutory independence and resources – the NIC would be fully independent of political parties and have guaranteed funding, so they aren't afraid of political reprisals. A Chief commissioner and two deputies would be appointed for fixed terms – ensuring they cannot be sacked for political reasons. Investigative powers of a Royal Commission – this means that the commission could force people to testify and gather all relevant evidence. The ability to conduct open hearings in the public interest – so that cases are as transparent as possible. The ability to make referrals to the DPP and police for criminal matters – so that cases of criminal corruption can be fully prosecuted. Oversight by a bipartisan joint standing committee – to ensure that the conduct of the NIC is fair and non-partisan. Ability to make findings of fact – the NIC would be able to declare that a public officer has acted corruptly, without necessarily needing to meet the sometimes-impossible threshold of obtaining a criminal conviction. If we want more positive democratic reform, it's critical we let our politicians hear it when they get it right!